Incidentally, the “x” marks on the image above are the time-lapsed captures of the space station as it transited across the sun at 5 miles per second during the eclipse. Pretty cool! People Love Breaks In Routine. The eclipse was a welcome break in the middle of an afternoon work day. Those who weren’t watching the eclipse were watching the people watching the eclipse. A leadership reminder: Sometimes breaking up the grind of work/life for your team with a nonwork-related event can be a good thing. Having a Hot Sun is Cool. In central Florida, the moon’s coverage of the sun was 81%, and it was still quite bright and hot. I’d guess that if you were working outside and weren’t aware you wouldn’t have noticed it. Our sun is pretty powerful if you can cover 80% of it and it’s still that bright. That’s pretty cool. I have no idea what potential effects an eclipse might have on a package in transit. It looked like PR to me (though, admittedly, I didn’t click on Learn More to find out). It’s Encouraging to See People Doing Good. Don’t waste your glasses: You can donate them to Astronomers Without Borders. They will distribute them to people in poor countries so they can safely view future solar eclipses. Good for them. 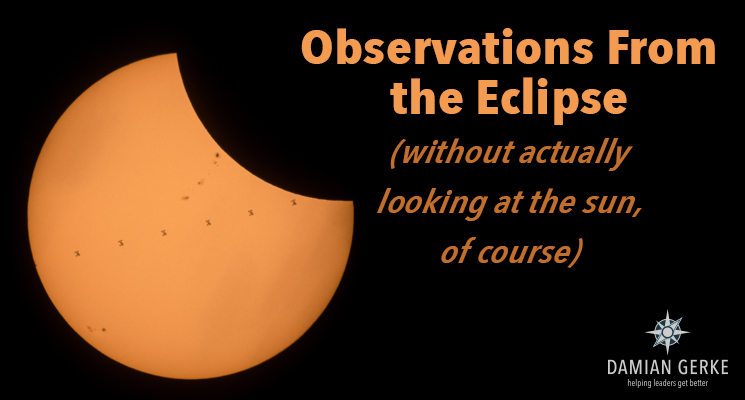 Like Yogi Berra said, “You can observe a lot just by watching.” What did you see surrounding the eclipse—without looking at the sun—that was interesting?